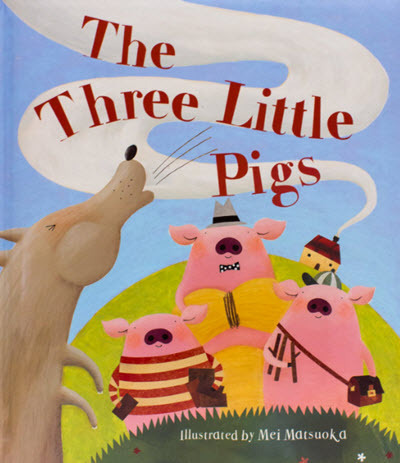 "The Three Little Pigs" is a fairy tale that children become familiar with at an early age. It is a fable because it has a moral message and involves animals. The story conveys warnings about laziness and advocates building strong shelters and not settling for cheap materials. There are multiple versions of the story involving three pigs being hunted by a wolf. The story was first seen in English fairy tale books from the 19th century. In the familiar tale three little pigs are sent off into the world by their mother. Each pig builds a house. One builds a house of straw, one builds a house of sticks and one builds a far more sturdy house made of brick. When a wolf comes after the picks he asks each pig to let him inside. The pigs refuse saying, "not by the hair on my chinny chin chin." The wolf then threatens, "Then I'll huff, and I'll puff, and I'll blow your house down." The wolf easily blows down the homes made of straw and sticks, but is unable to blow down the stronger and better made brick house. The first two pigs are eaten in the earliest versions of the tale. Only the third brick-laying pig survives. The first two pigs do not always die in some of the more recent versions of the tale. In some versions the pigs even end up eating the wolf. There are multiple morals in this story. It illustrates the importance of hard work. It is worth the time and effort to build something good. The straw using pig says in the story that he will use the straw so he can do less work and have more time to relax. The pig was lazy and made a fatal error in judgement. It also directly illustrates the importance of building a sturdy structure. The wolf could just as easily be a tornado or wind storm with the homes representing the types of homes people could build. A weak house would not be able to withstand some of the powerful storms England has received over the past couple centuries. A straw or stick house would be no match for a tornado. "The Three Little Pigs" story was first published in The Nursery Rhymes of England by James Halliwell-Phillips in 1886 according to the Wikipedia entry. It was then published in English Fairy Tales by Joseph Jacobs in 1890. The tale likely predates these books and as with many fairy tales the original author is unknown. Walt Disney made a short film version of "The Three Little Pigs" in 1933 as part of its Silly Symphony collection. In this version the hard working pig is known as "Practical Pig." The first two pigs survive by taking refuge in their brother's brick house in this version. You can find more about the Disney film on DisneyWiki. "The Three Little Pigs" is classified as ATU 124 under the Aarne-Thompson-Uther Classification of Folk Tales. It fits into the "Wild Animals and Domestic Animals" folk tales category. You can view more tales that fall with this category here. There have been many stories that are similar to "The Three Little Pigs." Several of them are described here on SurLaLune. There are many versions of "The Three Little Pigs" tale in bookstores. The book pictured above was illustrated by Mei Matsuoaka (Parragon Books) and can be found on Amazon.com.